In this article I will review how to order Basic Invite wedding invitations along with the pros and cons of buying stationery and other personalized wedding products from them. BasicInvite.com was founded in 2006 by an ambitious young entrepreneur by the name of Brock Bacik. Based out of Utah, Brock has been able to grow his client base and wedding stationery business over the past 9 years. We love the small scale, technology and design oriented business that Basic Invite offers as a brand to the market. As you can see from the homepage screenshot below, BasicInvite.com also offer stationery products for birthdays, babies, events, and even bar mitzvah thank you cards. A clean, responsive website design with a standardized layout including online shop functions like cart, account and currency in the top right corner. I like the horizontal layout that really uses the entire page of the website, including full photo slider that provides a sense of scale to the stationery. Good use of white space and top menu navigation, where again you have a solid layout that utilizes extended menus. You really don’t have to click much to find what you are looking for on the site. And if you need to do a text search, the search box is conveniently located on the main navigation bar. 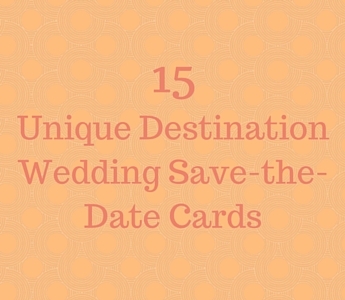 As of the date of this article, BasicInvite.com has 233 wedding invitations available. Certainly a good selection from which you should be able to find something that really speaks to you. 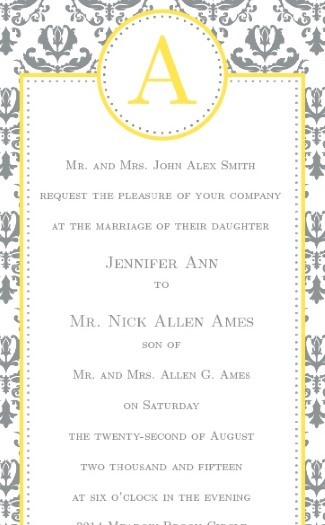 If you are after traditional designs or custom photo wedding invitations, consider browsing their selection. Two designs that caught my eye were a classic kraft paper invite perfect for a rustic wedding, and an elegant damask invitation for a more formal wedding. 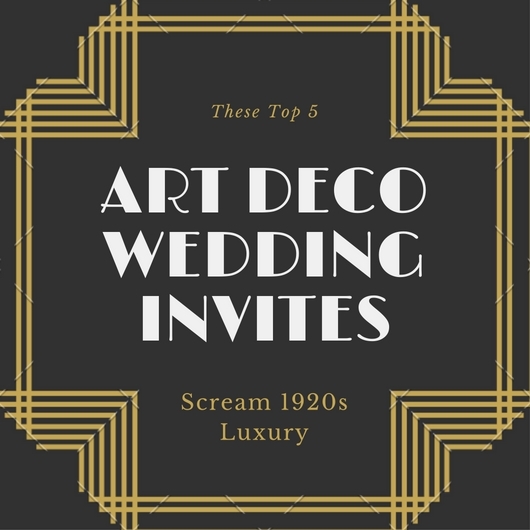 Strangely enough both invitation designs are a non-standard size, tall and narrow (3.75″ x 8.65″), which likely adds to the unique appeal. It seems people either love or hate the kraft paper look, I am a fan! I love what Basic Invite has done by providing a full custom sample package to potential customers for a very small fee. The sample pack includes a sample of all paper types, free color swatches, and comes packaged in an archival folder. The fee is small and I understand why they have to charge, it would be too cost prohibitive to send out sample packs to every potential client. I suspect if you like what they have to offer, you will go the route of getting a stationery sample pack first! Let’s take a look at the ordering process and just how easy it is to order stationery from Basic Invite. For this example we will continue with the kraft paper design that I like. Searching and filter options are straight forward and useful. In addition to standard filters such as wedding category, you can filter by size, number of photos, or number of folds. That last filter option is particularly useful if you know you would like a 2-fold wedding invitation. In addition you can use the sort functionality to sort by name, price, best sellers, trending, or most viewed. All useful sort/filter functions in my opinion. Click on an invitation that you like to start the order process. Select how many invitations you need for your wedding by choosing increments of 25 invites, or enter your own exact quantity. Before you select your paper type, you may want to read our article on how to choose wedding stationery paper. My suggestion is to stick with the recommended paper options – either premium matte or semi-glass (110 lb., white). If you really want to impress your guests, opt for the upgraded double thick paper at 200lb., 20pt thickness! 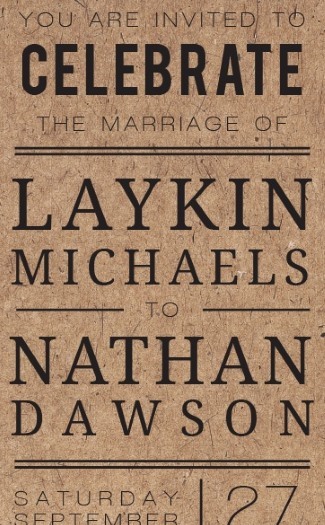 Now that is a hefty wedding invite. Basic Invite’s custom text and personalization functionality are top notch. Another great example of an intuitive and well designed interface to edit almost every aspect of your wedding stationery text and text colors. And when you apply changes, a preview of your wording will automatically appear on screen. You have the ability to fine tune every line of text in terms of font size, font color, alignment, or the font itself … a big bonus for those who like to experiment with different font types to achieve the perfect wedding look! In addition, I didn’t realize until I was doing a final edit of this post (and went back the next day to Basic Invite’s website), they have an easy drag and move function making it easy to reposition any text box item. Another great idea! Back of Invitations – The backside of your wedding stationery can be left blank (white). Otherwise, for a fee of $0.20 per invite you can select a pattern, color, or even upload your own photo. This particular invitation has more than enough room on the front side for all the pertinent information, so I will just go with the blank back. Complimentary matching white envelopes are included with your stationery. You can add a return address on the flap for an extra charge per envelope ($0.30 as of this article date). I like how the entire checkout process is contained on one page and broken out into clearly defined sections. Enter your billing information, select shipping method, fill in the payment information, and then move on to your final approval and order review. Proof – Review by Basic Invite is not free, which means you either have to be satisfied with your work (double check everything!) or pay a fee in order to have their design team review your invites. If you are satisfied, simply check the box that indicates you have reviewed your order and then click add to cart. Standard shipping is a modest $7.99, which is about middle of the road in terms of cost for shipping. Be sure to checkout coupons and deals as sometimes free shipping is offered. Place your order and you are on your way to receiving your fantastic stationery items! 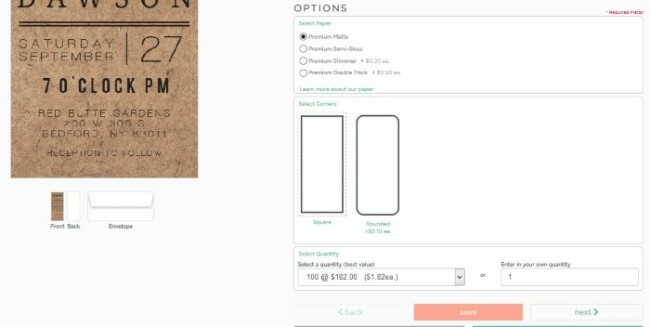 In the example I chose above, a standard quantity of 100 wedding invites with minimal alterations will set you back $182. Of course, you can buy slightly less expensive stationery, or custom photo invites that cost more from Basic Invite. Check the website for latest prices and selection. I went through most of their wedding invitation catalog to see that prices range from starting as low as $0.92 up to $1.52 per item. Of course, you only receive that low price if you are purchasing a quantity of 500! More realistically, prices for a quantity of 100 range from $1.71 to $2.36 per invite. Basic Invite provides value in their wedding stationery. With a Love it Guarantee, outstanding sample packs before you buy, and positive online reviews all around, this is one stationery company to consider for your wedding needs.